Ultrasonic Cavitation or Ultrasound Liposuction is a new, non-surgical fat removal procedure. This revolutionary procedure was designed in Europe. Because there is no surgery and no anesthesia, there is no hospital stay, no time off from work and no recovery time. Clients see immediate results and will continue to see results in the reduction of fat for up to a week following the treatment. The treatment uses cavitation technology which allows for a non-surgical attack of inflexible fat deposits that, no matter how much you diet and exercise, never seems to disappear. Unlike a traditional tummy tuck or liposuction, in ultrasonic cavitation, there are no knives, no anesthesia and no surgery. Ultrasonic cavitation is similar to mesotherapy or lipodissolve in that it is a treatment for cellulite called localized adiposity. The most common problem areas include the buttocks, abdomen, love handles (flanks), saddle bags (thighs), upper arms, inner knees and male breasts. Body contouring offers a way to get the client’s body in its best possible shape, while requiring no recovery time, leaving no scars, and utilizing no anesthesia. Ultrasonic Cavitation is also known as Fat Cavitation or Lipo Cavitation. Men also benefit from Ultrasonic Cavitation as well. Male sessions include therapy treatments for the male breasts and love handles in clients who may have considered the procedure for male chest fat removal known as Gynecomastia. After receiving Ultrasonic Cavitation, many of these men are very pleased with the results and change their minds about the participating in other more invasive procedures. Ultrasonic Cavitation is the perfect treatment for women who want to contour their body and regain their confidence. Most clients see an immediate change in their appearance after only the first session, with optimum results after two to five sessions. While this is a non-surgical way to sculpt and contour the body, this is not a replacement to a healthy diet and regular exercise. Ultrasonic Cavitation helps clients regain confidence and improve their overall condition of the appearance of their bodies. Ultrasonic Cavitation is a non surgical and non anesthetic method of liposuction. The procedure is very popular in Europe and has quickly spread across the globe. Ultrasonic Cavitation destroys intractable fat cells by using low frequency sound waves. A MHz or “Megahertz” is 1,000,000 hertz and a rating of 40 KHz to 5 MHz is used in an ultrasonic treatment. This type of sound wave can destroy the fat cells without causing damage to any other tissues or organs. Clients see results after the first two hour Ultrasonic Cavitation and RF Therapy session. 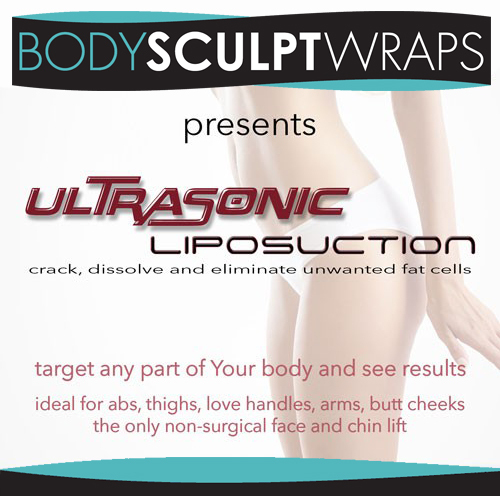 Ultrasonic therapy forces a powerful sound wave to the fat cell membranes. The fat cell membrane succumbs to the pressure, is reduced to liquid and is expelled through the body’s normal metabolic method. Ultrasonic Cavitation destroys fat cells at such a rate and in such a quantity that fat storage is significantly reduced or eliminated. Clients see the results and are pleased with the increase in their body’s fat cell metabolism. To understand how the ultrasound treatment affects fat cells, watch this You Tube Video. The Egg Experiment, watch this YouTube Video. To control the amount of toxins being eliminated from the body at one time, a limit of four body parts per treatment session is recommended in one day. The client is able to choose from three of the following body parts that are safe to treat in any one session. Ultrasonic cavitation therapy makes it possible to apply concentrated levels of ultrasonic energy to specific treatment areas. This type of therapy targets and destroys subcutaneous fat cells in the fat cell membranes through a series of microscopic implosions. Once the fat cell membrane (adipose tissue) is destroyed, the fat is discharged between the cells where they are turned into protein and then changed to free fatty acids and glycerol. Free fatty acids are moved to the liver where they decay and are removed from the body while water-soluble glycerol is transported to the circulatory system and used as energy. Tripolar RF metabolizes the large fat granules that were exploded by the first cavitation treatment. Heat forces collagen fibers to contract in the subcutaneous and dermis layers, which immediately tighten. New collagen is produced as Fibroblast metabolism is increased, creating a long term result of smoother and firmer skin. Since RF energy affects the deeper dermal layers, the result is a lifted contour, a decrease in deep wrinkles, thicker and firmer skin. RF promotes new collagen protein which causes the original collagen protein to strengthen the skin. Lipolysis (mono-polar Radio Frequency combined with cavitation), causes the remaining adipose tissue (fat cell membrane) to explode and forces the removal of triglycerides as well as a tightening of the skin. Instantly shortens original collagen fibers, resulting in the appearance of lifted and tightened skin. New collagen and elastin fibers are produced increasing a tightening of skin. Fragile cells called adipocytes are stimulated to release fat into the bloodstream removing them. After the first treatment, clients experience a reduction of several accumulated inches in circumference and notice additional results following usage of the scientifically formulated BodySculpt Wrap and several days of drainage after the procedure. In treatments to follow, further results can seen more rapidly with the nutritional modification, client compliance, and longer use. Age, metabolism, changes in hormones, medications, tissue structure and treatment area will also have an impact on the results. Although most results are immediate, in order to maintain the results, it is important to follow a healthy diet and exercise regularly. Most clients find the treatment to be very comfortable and pain-free. Some clients experience warmth during the treatment and a small amount of disruptive noise, but there is ultimately no pain felt during the procedures. It is important to follow a low calorie and healthy diet and to drink 8 glasses of water at least one day before and after the treatment. Fat elimination is accelerated by the amount of water consumed; therefore, water is key component to eliminate the fat. For optimum results, specified instructions are given upon appointment scheduling in preparation for procedure. Results of Ultrasonic Cavitation vs. Liposuction or Tummy Tuck? The results of the Ultrasonic Cavitation are very similar to those of Liposuction and Tummy Tucks as it safely (with no damage to the vascular system) removes and prevents recurring cellulite in the treated areas. Ultrasonic Cavitation creates lipolysis of fatty acids from the fat cell membrane or adipocytes by the process of stable cavitation. Ultrasonic Cavitation increases cell penetration of the adipocytes. There is an increase in triglyceride flow and a destruction of the fibers. Since the liver metabolizes a part of the adipocytes and expels it in the urine, it is necessary to drink plenty of water before and after the treatment. While you will see immediate results in the first session, it is recommended to have between 8 and 12 sessions for optimum results.